After a couple of cool, cloudy and drizzly days, the sun finally shone over Canberra today, giving members of the IU delegation their best glimpse yet of the acclaimed architectural features and carefully calibrated streetscapes of Australia’s capital city. There’s a striking symmetry to Canberra’s design and a certain serene and holistic quality to this unmistakably busy and dynamic city. Indeed, much of Canberra’s calm seems to emanate from how neatly nestled its many contemporary-style buildings, homes and monuments are among the city’s many forests, hills, tree-lined streets and large open green spaces. 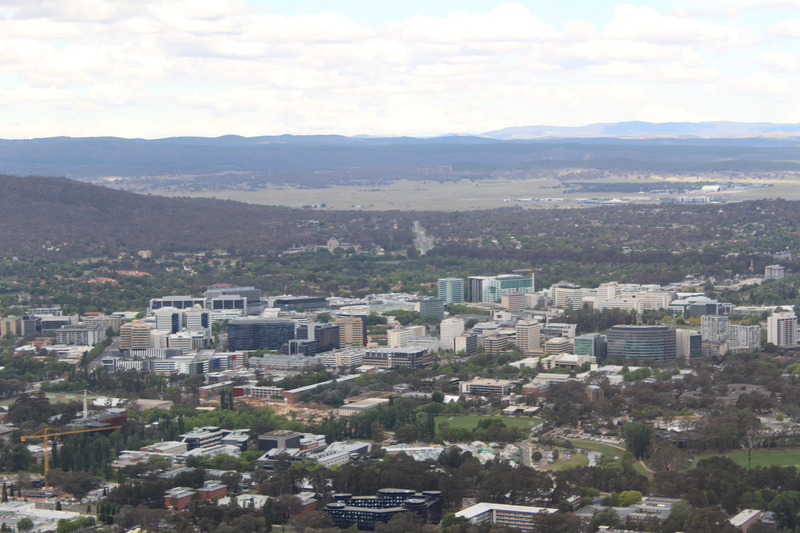 View of Canberra and Australia National University from Telstra Tower, which rises 640 feet above the summit of Black Mountain. Canberra, which was chosen in 1908 as the site for nation’s capital, has an unusual history among Australian cities in that, like Washington, D.C., it was entirely planned outside of any state. In fact, it was a major American architect, Walter Burley Griffin, and his wife, Marion Mahony Griffin, who drew up the city’s blueprint. The Griffins’ design featured various geometric shapes such as circles, triangles and hexagons and was heavily influenced by the garden city movement, a method of urban planning initiated at the end of the 19th century in the United Kingdom in which communities are surrounded by “greenbelts.” Rather than operate like a grid, Canberra’s major roads follow a “wheel and spoke” pattern that, at least during our travels here, ensured a smooth traffic flow in and around the city and reduced the thruway tension one might expect to be associated with a city of nearly a half-million people. As members of the IU delegation experienced Monday during partnership meetings at the Australian National University that suggested an extremely bright future for the longstanding IU-ANU relationship, the city’s beauty and energy are truly infectious and inspiring. Tuesday was the day of the Melbourne Cup, Australia’s most prestigious thoroughbred horse race – better known here as the “race that stops a nation.” For members of the IU delegation, the Melbourne Cup signaled their arrival at the backstretch of this busy and productive presidential trip, which began in Tokyo over a week ago. Buoyed by Monday’s successful summit meeting at the Australian National University, IU President Michael A. McRobbie, Vice President for International Affairs David Zaret and their colleagues met today with the leaders of several national government, nonprofit and scientific research organizations. Among them were the top executives of Universities Australia, which supports the national policy framework in which the country’s top universities operate, one characterized by quality, accessibility, innovation, internationalism and high performance; the deputy secretary of the Australian Government Department of Education and Training, which oversees national policies and programs that help Australians gain access to quality and affordable higher education; and the Commonwealth Scientific and Industrial Research Organization, a corporate entity that carries out scientific research to assist Australian government and business needs and commercialize new innovations. CSIRO, which works with nearly 50 Fortune 500 companies and a number of major international organizations, is also aiming to increase its presence in the U.S. through a new Chicago office and partnerships with our country’s large research universities. 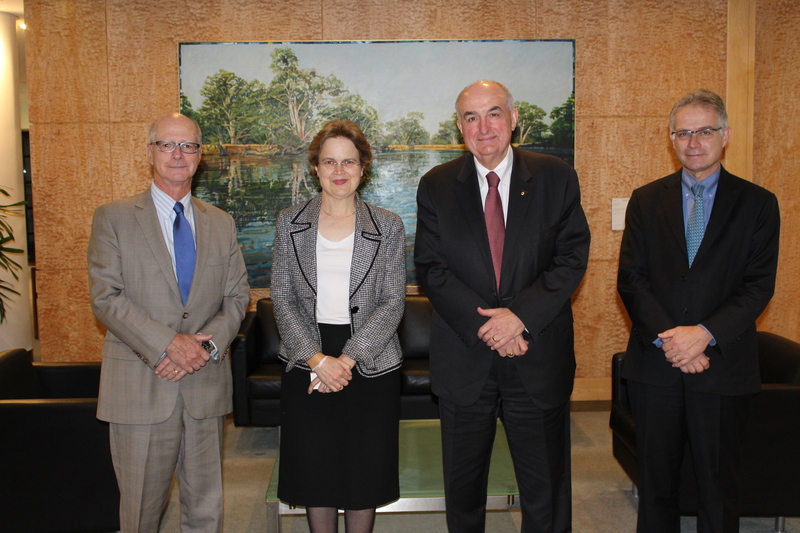 From left: David Zaret, IU vice president for international affairs; Frances Adamson, secretary of Australia’s Department of Foreign Affairs and Trade; IU President Michael A. McRobbie; and Shawn Reynolds, IU associate vice president for international partnerships. McRobbie and Zaret also had an enlightening and productive meeting with Frances Adamson, secretary of Australia’s Department of Foreign Affairs and Trade and former Australian ambassador to China. Together they discussed common goals, such as encouraging more U.S. and Australian students to study abroad, and possible collaborative activities that would ensure greater understanding of contemporary Australia and its role as a major strategic player in the Asia-Pacific region of the world. Meetings with leading Sony executives to discuss how to further strengthen a successful IU-Sony relationship that, to date and under the direction of IU’s Media Digitization and Preservation Initiative, has resulted in the digital preservation of 250,000 priceless audio and video recordings at IU for future generations of scholars and students. A spirited performance of Ein Deutsches Requiem by Johannes Brahms, marking the 500-year anniversary of the Reformation, by two IU Jacobs School of Music alumni at the Tokyo Metropolitan Theatre. A successful meeting at the Japan Foundation, the country’s only institution dedicated to fostering cultural exchange programs throughout the world. A home-run celebration to honor IU’s Japan Alumni Chapter, IU’s oldest global alumni chapter, and two of the university’s most distinguished international graduates. 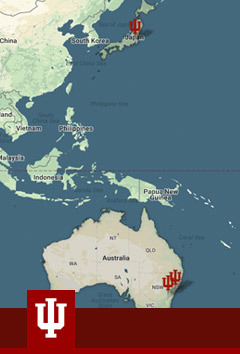 A celebration of IU’s Australian alumni in Sydney who are contributing to an increasingly active chapter. Participation in the second annual Indiana University-Australian National University summit meeting, which included faculty from both institutions who discussed their work and possible future collaboration in such areas as art and design, business, cybersecurity, law, linguistics, public affairs and public health. A formal extension of IU’s longstanding partnership with ANU, which has generated exchanges of faculty, students and staff and supported collaborative research and scholarship led by the ANU-IU Pan-Asia Institute. Productive meetings with top government and education officials in Australia and Japan that set the stage for further relationship building. Participants pose for a group picture after the second-annual IU-ANU summit meeting. Each of these activities reflected the depth, breadth and impact of IU’s ever-increasing engagement in this strategically important part of the world. Each also highlighted a university that, without question, is among our nation’s most international universities, with an alumni base that gets stronger each day as its members enthusiastically embrace their role as IU’s greatest global ambassadors. And like the planning that went into designing the city of Canberra, there’s a method to IU’s internationalization efforts and, in particular, its strategic partnerships, which have been carefully calibrated to support students for whom an international experience has never been more vital and to address the needs of communities around our state that are increasingly impacted by foreign investment and activities around the world. Thank you for following along, and see you back home in Indiana!